Peptide loading of MHC class II (MHCII) molecules is assisted by HLA-DM, which releases invariant chain peptides from newly synthesized MHCII and edits the peptide repertoire. Determinants of susceptibility of peptide/MHCII complexes to DM remain controversial, however. Here we have measured peptide dissociation in the presence and the absence of DM for 36 different complexes of varying intrinsic stability. We found large variations in DM susceptibility for different complexes using either soluble or full-length HLA-DM. The DM effect was significantly less for unstable complexes than for stable ones, although this correlation was modest. Peptide sequence- and allele-dependent interactions along the entire length of the Ag binding groove influenced DM susceptibility. We also observed differences in DM susceptibility during peptide association. Thus, the peptide repertoire displayed to CD4+ T cells is the result of a mechanistically complicated editing process and cannot be simply predicted from the intrinsic stability of the complexes in the absence of DM. Major histocompatibility complex class II (MHCII)3 molecules on APCs present peptides to CD4+ T lymphocytes and thus control peptide-dependent selection, activation, and regulation of T cells (1, 2). The peptides that bind MHCII molecules are generally derived from proteins of the secretory pathway or the plasma membrane or are taken up by endocytosis (3, 4). Peptide loading occurs predominantly in late endosomes (pH 4.5–5.5) (4), although some evidence indicates peptide loading in early endosomes (5) and at the plasma membrane (6, 7). The structural requirements for peptide binding to MHCII are well understood. The peptide occupies a groove at the membrane-distal end of the MHCII molecule, with both termini protruding from the groove (8, 9, 10, 11, 12). Peptide binding involves interactions between peptide side chains and specificity pockets lining the groove (with P1, -4, -6, and -9 interactions contributing the most). These interactions can vary due to differences in peptide sequence or allelic variation in the pocket residues, which explains differences in stability between peptide/MHCII complexes (13, 14, 15, 16) and allele-specific sequence motifs of class II-associated peptides (3). Quantitative algorithms predict peptide/MHCII affinity from sequence (13, 14, 15, 16), but are less successful at predicting epitopes recognized during immune responses. In addition to sequence-dependent peptide/MHC interactions, conserved hydrogen bonds between the peptide backbone and the MHCII molecule tether the peptide in the groove in a sequence-independent manner (8, 9, 10, 11, 17), contributing critically to the overall stability of the complex (18, 19, 20). Several other molecules are involved in endosomal peptide loading of MHCII molecules (4, 21, 22). Invariant chain (Ii) associates with nascent MHCII molecules, occupies the Ag binding groove, and prevents binding of other ligands. Assembly with Ii results in export of the complexes to endosomes, where cathepsins proteolyze Ii, leaving a nested set of Ii peptides spanning residues 81–104 (collectively termed CLIP, for class II associated Ii peptides) in the groove. HLA-DM promotes the exchange of CLIP for endosomal peptides. It also alters the repertoire of non-CLIP peptides that bind to MHCII molecules, affecting the recognition of exogenous (23) and alloantigens (24, 25), and introduces a bias toward DM-resistant complexes (peptide editing) (26). DM does not measurably bind peptides (R. Busch and M. P. Belmares, unpublished observations); rather, it binds MHCII molecules (27, 28) and prefers empty MHCII molecules (28), stabilizing them against loss of binding activity (29). In vitro, DM catalyzes the release of CLIP and other peptides in an enzyme-like fashion, with optimal activity at endosomal pH (30, 31, 32, 33, 34), accounting for CLIP release and peptide editing by DM. Human and murine DM crystal structures revealed similarity to MHCII, except for lack of a binding groove (35, 36). Mutagenesis identified the DM interaction surface of HLA-DR as a lateral face, comprising residues on the membrane-proximal and peptide-binding domains near the peptide N terminus (37). The structural parameters that determine the DM susceptibility of peptide/MHCII complexes remain unclear. Early studies suggested that unstable complexes are DM susceptible, whereas stable ones are resistant (30). Peptide length and destabilizing glycine and proline residues were reported to influence DM susceptibility (38, 39). However, another study found that dissociation of stable and unstable complexes was accelerated by DM to a similar extent (40). This suggested that DM disrupts the conserved hydrogen bond network, rather than side chain/pocket interactions. In contrast, our recent studies confirm that different peptide/DR complexes are differentially susceptible to DM (41). In another report stable occupancy of the P1 pocket rendered peptide/DR complexes DM resistant (42). All results are consistent with functional effects of DM on the peptide repertoire, although models derived from each dataset would make different predictions about the fate of any given peptide/DR complex. Here, we have attempted to identify structural determinants of DM susceptibility. We found that the intrinsic stability of peptide/DR complexes is a weak predictor of DM susceptibility and that interactions along the entire length of the peptide-binding groove contribute to DM susceptibility. A cDNA for soluble DRB1*0404 was engineered as described previously for DR*0402 (41). Soluble HLA-DR4 (*0401, *0402, and *0404) molecules were produced as previously described (30, 41). Soluble HLA-DR*1501 (DR2b) with a covalently linked myelin basic protein (MBP) peptide was generated as previously described (43, 44); the peptide linker was thrombin-cleaved (Novagen, Madison, WI) to allow peptide exchange. Soluble DM was produced as previously described (30, 45, 46). Batches of soluble DM were compared for activity to minimize the influence of batch-to-batch variation (generally <2-fold) on DM susceptibility. Full-length HLA-DM, DR*0401, and DR*0402 molecules were expressed in insect cells (30, 45) and used as whole-cell extracts (5 × 107 cells/ml in PBS or TBS, 1% CHAPS or C12E9, plus protease inhibitors). Untransfected cell lysates served as controls. Peptides were synthesized with standard F-moc chemistry. Peptides were labeled at the N termini with CFSE (Molecular Probes, Eugene, OR) (47). Unlabeled competitor peptides were acetylated on the resin using a 10-fold molar excess of acetic anhydride and pyridine in dimethylformamide for 45 min. Peptides were purified by HPLC and were analyzed by mass spectrometry. The peptides used are listed in Table I⇓. Soluble DR4 (1.7 μM) or DR*1501 (2.9 μM) was incubated with excess (10 μM) fluoresceinated (f-) peptide overnight at 37°C in citrate/PBS, pH ∼5.3 (nine parts by volume of PBS = 10 mM sodium phosphate, 150 mM NaCl, and 0.02% NaN3, pH 7.0, plus 1 part 1 M sodium citrate, pH 4.8). Excess f-peptide was removed at 4°C using a 2-ml Sephadex G-50 superfine (Pharmacia, Piscataway, NJ) column blocked with 1% BSA in PBS. Complexes were eluted under gravity flow in PBS. The eluted complex was diluted to ∼800 μl, usually with PBS/citrate, pH 5.3. An unlabeled competitor (10 μM) was added to prevent f-peptide rebinding during dissociation: hemagglutinin306–318 for HLA-DR*0401, HCgp-39298–313 for DR*0402, human Ii 81–104 for DR*0404, and MBP 84–99 for HLA-DR*1501. When indicated, 0.25 μM soluble HLA-DM was added. The amount of complex remaining after various times at 37°C was quantified using high performance size exclusion chromatography with fluorescence detection as previously described (41). Plots of remaining complex vs time were fitted to single-exponential models to determine dissociation half-lives (t1/2): F/F0 = exp(−kt) = exp(−(ln2/t1/2)t), where F is the complex fluorescence at time t, F0 is the initial complex fluorescence (t = 0), and t1/2 is the half-life of the complex, which is related to the dissociation rate constant k by the equation, t1/2 = ln2/k. Where indicated, double-exponential fits were used. Curve fitting was performed using Kaleidagraph (Synergy Software, Reading, PA). DR*0402 (1.7 μM) was preloaded (48) for 5 days with 200 μM of an unlabeled, fast-dissociating peptide (murine Ii N-acetyl-85–99 V87A L96A M98F), at pH 5.3 and 37°C. Free peptide was removed as described above. The half-life of the preloaded complex is ∼25 min at pH 5.3 and 37°C without DM and ≤2 min in the presence of 0.25 μM HLA-DM. The preloaded complex (0.62 μM) was incubated with a mixture of human MBP fluorescein84–99 (f84–99) and human desmoglein 3 f192–204 (2.5 μM each) for 10 min to 1 h without DM or for 5–10 min with 0.25 μM DM. These association times are short relative to the half-lives of the individual complexes (MBP f84–99/DR*0402 t1/2 = 100 h without and 1.06 h with DM; desmoglein 3 f190–204 t1/2 = 39 h without and 1.9 h with DM, all at pH 5.3). Association was stopped and free f-peptides were removed at 4°C. To determine the relative amount of each f-peptide bound, the dissociation of the recovered complexes was followed in the presence of 10 μM competitor peptide (N-acetyl-MBP84–99) at pH 7.9 (7 parts PBS, pH 7, to 1 part 250 mM Tris, pH 8.0). A high pH diminishes the effects of DM and selectively destabilizes the desmoglein 3 f192–204/DR*0402 complex (49) (t1/2 = ∼0.5–1 h), whereas the MBP f84–99/DR*0402 complex remains long-lived (>30 h). The relative amounts of the two complexes were determined from the percentage of f-peptide complexes dissociating with fast and slow kinetics, respectively, by fitting the data to a double-exponential model. Their ratio was interpreted as a measure of the relative association rates of these peptides to DR*0402. Insect cell lysates expressing full-length DR*0401 or DR*0402 (10%, v/v) were incubated with N-terminally biotinylated HCgp39 peptides (10 μM; gift from G. Sonderstrup) overnight at 37°C. The assay buffer contained 1% Nonidet P-40, 1% BSA, 150 mM NaCl, and protease inhibitors (50), buffered to pH ∼4.7 with 50 mM sodium acetate or to pH ∼5.3 with 100 mM sodium citrate/10 mM sodium phosphate. Free peptide was removed by spinning (1000 × g, 4 min, 4°C) through a Sephadex G-50SF spin column at 4°C, which was blocked with BSA, equilibrated in several volumes of assay buffer, and spin-dried. Complexes were diluted to 1 ml in assay buffer containing excess unlabeled competitor peptide (50–100 μg/ml hemagglutinin307–319 for DR*0401 or human Ii81–104 for DR*0402) and either DM-containing (1%, v/v) or control lysates. The final full-length DM and DR concentrations were on the order of 15 and 10 nM, respectively. Complexes were allowed to dissociate for varying times at 37°C. Duplicate aliquots were neutralized using 2 vol of ice-cold neutralization buffer (assay buffer with 50 mM Tris-HCl buffer, pH 8.8), and DR was captured on anti-DR (mAb L243)-coated ELISA plates. Bound biotinylated peptides were quantified using Eu3+-labeled streptavidin as previously described (30, 45). To study structural effects on DM susceptibility we employed soluble, insect cell-derived forms of four human MHCII alleles (the common HLA-DRA*0101-encoded DR α-chain paired with β-chains encoded by HLA-DRB1*0401, *0402, *0404, or *1501). The peptides used included several naturally processed epitopes of the known human autoantigen, human chondrocyte glycoprotein (HCgp39), presented by DR*0401 molecules in humans (41, 51, 52); a HCgp39 peptide that is immunodominant in DR*0402 mice (41, 52); a human type II collagen peptide that is arthritogenic in DR*0401-transgenic mice (53); and a peptide from MBP recognized by T cells from DR*1501(DR2b)- and DR*0401-expressing patients with multiple sclerosis (54). These peptides were also tested for binding to MHCII alleles that are not known to present them, so as to reduce bias due to selection of immunodominant peptides and/or autoantigens. We also made use of the ability of Ii-derived CLIP and its variants to bind to multiple MHCII alleles (55, 56, 57). Of the f-peptide/DR combinations tested, 36 proved to bind well enough for analysis of dissociation kinetics (Table I⇑). They include 5–11 complexes from each of the four DR alleles, 6 known immunogenic/immunodominant complexes (17%), and a similar number of CLIP variants (16 of 36, 44%) and non-CLIP (20 of 36, 56%) complexes. To evaluate the effects of DM on the half-life of the DR/peptide complexes, we used a quantitative high performance size exclusion chromatography assay to measure dissociation of f-peptides from DR molecules at endosomal pH (5.3) in the presence or the absence of a fixed amount (0.25 μM) of soluble DM. Representative dissociation curves are shown in Fig. 1⇓. In most cases, a good fit to single-exponential decay was observed, indicating that the complexes formed were kinetically homogeneous. For selected com-plexes, we verified that the rate was linearly dependent on the concentration of soluble DM, as expected for the action of a catalyst (Fig. 2⇓). Thus, the rate equation could be written as a sum of a DM-independent, first-order reaction (characterized by an intrinsic dissociation rate constant, kin) and a DM-dependent second-order reaction (characterized by another rate constant, kDM): dissociation rate = kin [complex] + kDM [complex] [DM], or kobs = kin + kDM [DM]. One implication of this simple behavior is that two measurements of dissociation half-lives, in the absence and in the presence of a fixed amount of soluble DM, are sufficient to determine DM susceptibility. Table I⇑ reports t1/2, in and t1/2, obs at a standard concentration of DM, 0.25 μM. The ratio of the two rate constants, kobs/kin = t1/2, in/t1/2, obs is also shown. It represents the rate acceleration by 0.25 μM DM, a convenient measure of DM susceptibility. Representative dissociation kinetics. The dissociation of f-MBP84–99/HLA-DR*0402 (A), f-MBP84–99/HLA-DR*0401 (B), murine hemoglobin64–76 V67I I68V/HLA-DR*0402 (C), and human Ii CLIP81–104 L97A/HLA-DR2b (D) were measured at 37°C, pH 5.3 with (□) or without (○) 0.25 μM soluble HLA-DM (see Materials and Methods). The fluorescence value at time zero was arbitrarily set at 1. Each solid line is a fit of the data to a single exponential model. Excess of an unlabeled peptide competitor was added to prevent f-peptide rebinding to MHCII. The insets in A and C show dissociation kinetics at early times. Linear dependence of the dissociation rate constant on HLA-DM concentration. The dissociation rate constant (○) of various f-peptide/MHCII complexes was measured as a function of DM concentration. The solid lines are best fits of the data for each complex to kobs = kin + kDM [DM], where kin is the measured rate constant of the complex in the absence of DM, kDM is the best-fit slope, and [DM] is the concentration of DM. The complexes are MBP84–99/DR*0404 (A), HCgp-39298–313/DR*0402 (B), hemoglobin mutant (f-GKKIVTAFNEGLK)/DR*0402 (C), murine Ii 89–99/DR*0404 (D), and MBP84–99/DR*0401 (E). The intrinsic stability of the complexes was distributed relatively evenly over 3 orders of magnitude (Table I⇑ and Fig. 3⇓), ranging from minutes to weeks. Thus, the choice of complexes did not introduce undue bias in this regard. Interestingly, DM susceptibility also varied over 3 orders of magnitude in this assay (Table I⇑ and Figs. 1⇑ and 3⇓). Thus, the magnitude of the DM effect depended strongly on the identity of the peptide/DR complex. Relationship between intrinsic and DM-catalyzed dissociation for 36 different peptide/MHCII complexes. Dissociation rate constants calculated from the t1/2 (Table I⇑) are plotted on a log10 scale in units of hours−1. The x-axis shows intrinsic dissociation in the absence of DM. The y-axis shows dissociation in the presence of 0.25 μM soluble DM. The dashed line of slope 1 through the origin indicates no DM effect (kobs = kin). The vertical distance of each data point from this line is a measure of DM susceptibility, because log kobs − log kin = log (kobs/kin) = log (t1/2in/t1/2obs). A, Correlation between kin and kobs. The solid best-fit straight line through the data has a slope of 0.47 (95% confidence interval, 0.3–0.64; thin dashed curves) and a correlation coefficient of 0.694 (p < 0.0001). Individual values for kin and kobs have an error of about ±20%, so most of the deviations from the straight line are beyond experimental error. One exceptionally DM-resistant complex (HC gp39262–276/DR0401), which was excluded from correlation analyses, is shown as a filled symbol. B, Effects of MHC II polymorphism. Significantly non-zero correlations are seen for DR0401 (slope = 0.71; p = 0.001) and DR0402 (slope = 0.55; p = 0.006). Comparisons between slopes reveal no significant differences (p = 0.18). C, Effect of N-terminal overhang. Differences in slopes for short (one to three residues), medium (four to six residues), and long (seven or more residues N-terminal to P1) N-terminal overhangs are not significant (p = 0.10). The correlation for medium overhangs is significant (slope = 0.66; p < 0.0001). D, Effect of C-terminal overhang. Significant correlations between kin and kobs are seen for short (C-terminal residue is P9 or P10; slope = 0.73; p < 0.0001) and long (P11 or longer; slope = 0.26; p = 0.008) C-terminal overhangs. The difference between slopes is marginally significant (p = 0.053 with Bonferroni correction for 11 comparisons between slopes). To investigate the relationship between intrinsic stability (as measured by kin) and DM susceptibility, we plotted kin against kobs on a logarithmic scale (Fig. 3⇑A). A significant correlation was observed between intrinsic stability and stability in the presence of DM (p < 0.0001). However, the intrinsic stability of any one complex was a poor predictor of DM susceptibility, as the correlation coefficient was only modest (r = 0.693). Greater than 3-fold (0.5 log) deviations from the best-fitting straight line were seen in seven of 36 (19%) complexes. This is highly unlikely to reflect experimental error, which was <20% for most complexes. In one particularly striking instance, an extremely stable complex, DR*0401/HC gp39262–276, was almost entirely resistant to DM. (This complex was treated as an outlier in statistical analyses.) Interestingly, the slope of the best-fitting straight line was 0.47 (95% confidence interval, 0.30–0.64). In contrast, a slope of 1 would have been expected if all complexes were equally susceptible to DM: for kobs/kin = constant, a log/log plot would obey the equation, log kobs = log kin + constant. The implication is that, on the average, DM susceptibility (as represented by the vertical distance between the observed log kobs values and a straight line of slope 1 through the origin; see Fig. 3⇑) increases with increasing complex stability (or with decreasing values for kin). Extrapolation of this line suggests that a complex with an intrinsic lifetime (t1/2) ≤1.24 min should not be affected substantially by DM under these experimental conditions. We conclude that intrinsic stability only modestly predicts DM susceptibility and that other factors are likely to be involved as well. To search for other factors that predict DM susceptibility, we investigated subsets of these data, stratified by MHCII allele (Fig. 3⇑B), the length of N- or C-terminal overhangs (Fig. 3⇑, C and D, respectively), and CLIP vs non-CLIP peptides (not shown). Overhangs were assigned based on alignment of peptides to known binding motifs for the different MHCII alleles and were verified in some instances by mutating putative P1 anchor residues (M. Belmares, unpublished observations; cf Table I⇑). No significant differences were detected between MHCII alleles (Fig. 3⇑B), peptides of varying N termini (Fig. 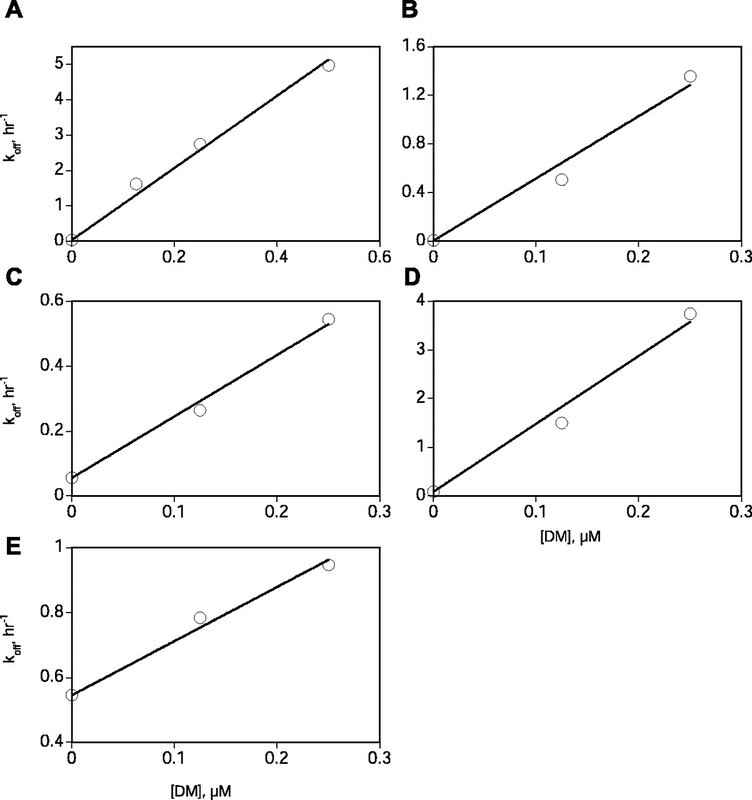 3⇑C), or CLIP and non-CLIP peptides (p > 0.05 for all comparisons, excluding the outlier). There was a suggestion that C-terminal extensions influence the relationship between intrinsic stability and DM susceptibility (p = ∼0.05 for C-terminal overhangs of P11 or longer vs shorter overhangs; Fig. 3⇑D). The interpretation of this putative effect is in doubt, because many peptides with long C-terminal overhangs also happened to have extended N termini. Individual comparisons between closely related peptides differing only in their N-terminal overhangs also failed to reveal strong effects on DM susceptibility. For instance, no differences were observed when N-terminally extended vs short human CLIP peptides were compared or when a nonconservative (V→K) substitution was made in the P(-1) position of MBP84–99 (Table I⇑). These findings are consistent with previous reports (40) and our own observations (M. P. Belmares and R. Busch, unpublished) that the N-terminal peptide overhang does not substantially affect DM activity. To obtain more information about structural factors influencing DM susceptibility, we compared other closely related complexes. In considering differences in DM susceptibility (kobs/kin), the overall correlation between kin and kobs (Fig. 3⇑A) is a possible confounding factor, since a structural change may affect DM susceptibility simply by virtue of its effect on intrinsic stability. Specifically, from the correlation in Fig. 3⇑A, a 10-fold (1 log) change in kin predicts a 100.47 or 3.0-fold increase in kobs and a 100.53 or 3.4-fold decrease in kobs/kin. Thus, to identify effects on DM susceptibility that are independent of intrinsic stability, we examined the deviations of observed data points from the best-fit line for pairs of complexes. One special case occurs when two structurally related complexes are equally DM-susceptible despite differing substantially in intrinsic stability; in this case, the lack of a net change in DM susceptibility may reflect compensating effects. Examples of these different scenarios follow. Based on individual comparisons, we found one example suggesting that the peptide P1 anchor may influence DM susceptibility. A mutation from Val to Ile in the P1 anchor of the peptide f-MBP84–99, which stabilizes a complex with HLA-DR*1501 by 6-fold in the presence and the absence of DM, leaves the dissociation enhancement by DM (kobs/kin) unchanged. The change at P1 thus reduces DM susceptibility 2.6-fold from the value predicted by its effect on intrinsic stability (Fig. 3⇑A). P1 anchor effects do not appear dominant, however: a wide range of dissociation enhancement by DM is seen among peptide/DR*0401 complexes where the peptide P1 anchor is Phe (Table I⇑). These results suggest that at least some of the variations in DM susceptibility are due to peptide/MHCII interactions outside the P1 pocket. Consistent with this possibility, comparisons between closely related complexes suggest that C-terminal anchor residues (P4-P10) can influence DM susceptibility. One informative comparison involves the following complexes: f-KPVSQMRMATPLLLR/DR4*0402 (t1/2,in = 1.4 h; kobs/kin = 19.4), f-KPVSQMRMATPLLER/DR4*0402 (t1/2,in = 11.4 h; kobs/kin = 21.5), and f-KPVSQMRMAQARPMR/DR4*0402 (t1/2,in = 340 h; kobs/kin = 73.1). These peptides are murine f-Ii85–99 variants with a mutation(s) in the C-terminal sequence (P5-P10 positions, shown in bold) but with identical N-termini. The Met P1 anchor of each peptide is underlined. In qualitative agreement with the trend shown in Fig. 3⇑A, the DM susceptibility is 3.8-fold larger for the most stable peptide than for the least stable one. However, the difference is ∼5-fold less than might have been expected from the correlation in Fig. 3⇑A. Similarly, the change in DM susceptibility due to the Leu224Glu change in P9 is less than expected from the change in intrinsic stability, which increases 8-fold and predicts a 2.8-fold difference in DM susceptibility (as shown in Fig. 3⇑A). These results suggest that DM susceptibilities is influenced (in these cases) both by differences in the intrinsic stability of the complexes and by compensatory effects of the C-terminal substitutions. In a second example, the DM susceptibilities of complexes between DR*0401 and the peptides f-KMRMATPLLMQALPM (t1/2in = 6.0 h; kobs/kin = 13) and f-QMRMATPLLMR (t1/2in = 7.8 h; kobs/kin = 42) are measurably different, even though their intrinsic stability is essentially the same. The core sequences in both peptides are the same, with differences in bold. As discussed above, the Gln/Lys difference in the P(-1) position is not likely to account for the dissociation enhancement differences, leaving the C-terminal difference as a more likely explanation. Taken together, these examples argue that C-terminal anchor residues can affect the DM susceptibility of peptide/MHCII complexes independently of their effects on intrinsic stability. Removing the membrane anchors of either DM or DR decreases the efficiency of interaction by at least 2 orders of magnitude (45, 58). This is the main functional difference between soluble recombinant and native DM. To address whether the membrane anchors reduce the effect of peptide structure on DM susceptibility, we assayed peptide dissociation using full-length recombinant DM and DR molecules. Fig. 4⇓ compares the dissociation enhancements for full-length DM and full-length DR/peptide complexes with values observed using soluble molecules. Even though under the conditions used, DM effects generally are less pronounced in the full-length system, we found a clear correlation between the DM susceptibility of different complexes in both systems. Enhancement of dissociation by full-length DM ranged between 2.2- and 16.3-fold (a 7.5-fold variation), compared with a 14.7-fold variation in DM enhancement (range, 7- to 103-fold) for the same complexes using soluble molecules. 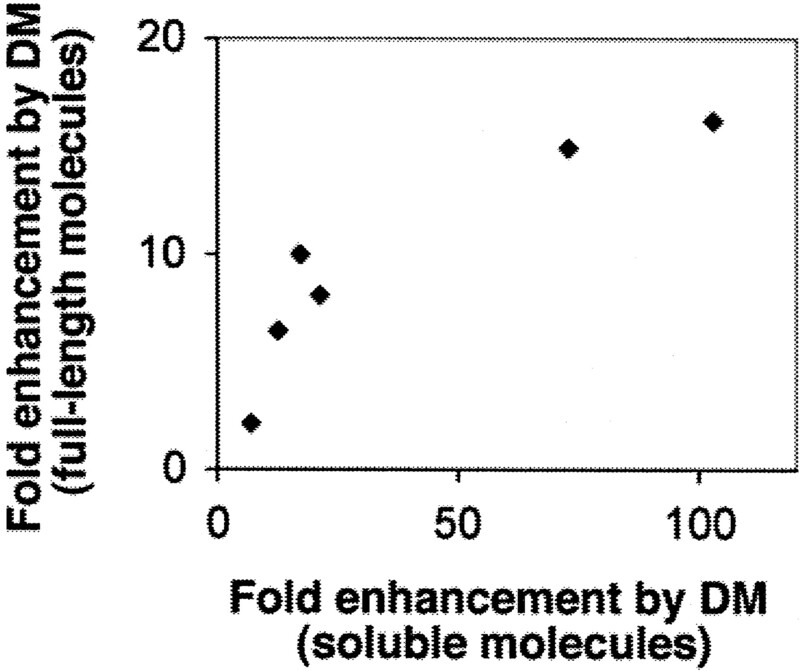 Thus, substantial variation in DM susceptibility exists for full-length molecules. Quantitative differences could be due to a genuine effect of the membrane anchors or to assay differences, including the use of detergent to solubilize full-length molecules. DM susceptibility of full-length and soluble MHCII/peptide complexes. The susceptibility of various soluble MHCII/peptide complexes to soluble DM (kobs/kin, x-axis) (41 ) was plotted against the susceptibility of the corresponding full-length MHCII/peptide complexes to full-length DM (y-axis). In order of increasing susceptibility to soluble DM (x-axis), the complexes tested were HCgp-39298–313/DR*0401, HCgp-39322–337/DR*0402, HCgp-39100–115/DR*0402, HCgp-39322–337/DR*0401, HCgp-39262–276/DR*0402, and HCgp-39298–313/DR*0402. Note the similar rank order for full-length and soluble complexes. To test whether differences in DM susceptibility between complexes are also detectable during association, we measured the relative association rates of two peptides to MHCII with and without HLA-DM. Upon dissociation of a pre-bound peptide, MHCII molecules are released in a peptide-reactive state, allowing rapid binding of added peptides (48). However, the peptide-reactive state inactivates rapidly (t1/2 ≤ 10 s; M. P. Belmares, unpublished observations), making measurements of absolute association rates difficult. Even the best methods currently available for estimating absolute on-rates make critical simplifying assumptions regarding both the mechanism of peptide association to the peptide-reactive state and the mechanism of MHCII inactivation (48, 59). However, deviations from these assumptions have been noted previously (48, 59) (M. P. Belmares et al., unpublished observations). It is unclear to what extent such complications might interfere with the detection of small differences in on-rates. However, we reasoned that these difficulties might be circumvented by measuring the relative association rates of two different peptides. To this end we decided to measure the relative amount of each peptide bound under conditions where both peptides compete for binding and dissociation of newly formed complex is negligible. This competitive design allows determination of relative association rates without invoking the aforementioned mechanistic assumptions. The difference in bimolecular association rates is the only factor that can affect the relative amount of the two peptides bound. Specifically, we measured relative association rates for human f-MBP84–99 and human desmoglein 3 f192–204 binding to DR*0402. These complexes differ substantially in susceptibility to DM-catalyzed dissociation, suggesting that their formation may also be differentially catalyzed by HLA-DM. An equimolar mixture of these two peptides was incubated with preloaded DR*0402 with or without DM. (DR molecules had been preloaded with a fast-dissociating CLIP variant to maximize availability of active DR molecules (48).) The association time was kept short compared with the dissociation half-lives of the resultant complexes to avoid confounding effects due to differential dissociation of the two complexes. The relative fraction of each complex was measured by exploiting its differential stability to dissociation at slightly alkaline pH (Fig. 5⇓). In the absence of DM, the relative association rates of MBP f84–99 and desmoglein 3 f192–204 to preloaded DR4*0402 were 0.56 and 0.44 kon, respectively, where kon is a rate constant not determined directly. Association of the MBP peptide was ∼1.3 times as fast as that of the desmoglein 3 peptide. However, in the presence of DM the difference between the association rates increased to 4-fold, because the MBP peptide bound 82% of the available molecules, and the desmoglein peptide bound only 18%. Thus, DM accelerated association of the MBP peptide ∼3 times (4/1.3) better than the desmoglein peptide. This effect is close to that expected from dissociation experiments, where the MBP peptide is ∼4.4 times as DM susceptible as the desmoglein peptide. Thus, DM influences the relative association rates of peptides. DM differentially affects peptide association. Relative rates of binding to DR*0402 molecules were determined for two peptides, f-MBP84–99 and f-desmoglein 3 f192–204, in the presence and the absence of 0.25 μM soluble DM at pH 5.3 and 37°C. The relative amounts of the two complexes formed during association can be estimated from dissociation curves (see Materials and Methods). Shown are the amounts of total DR/peptide complex (y-axis, normalized to 1 at time zero) remaining after various dissociation times for mixtures of complexes formed with (▵ or outlier □) and without (○) DM. Lines indicate best fits of both datasets to a double-exponential model. The fast component corresponds to the relative amount of the desmoglein f192–204/DR*0402 complex. Whether all peptide/MHCII complexes are equally susceptible to DM-catalyzed dissociation has been controversial (30, 38, 39, 40, 41, 42). Our survey of a wider range of peptides and MHC class II alleles clearly established that there are large variations in DM susceptibility, ranging over several orders of magnitude. Large differences in DM susceptibility were seen for different peptides binding to the same MHCII allele as well as for one peptide binding to different MHCII alleles. Our results thus establish a role for both peptide sequence and MHC polymorphism in controlling DM susceptibility. 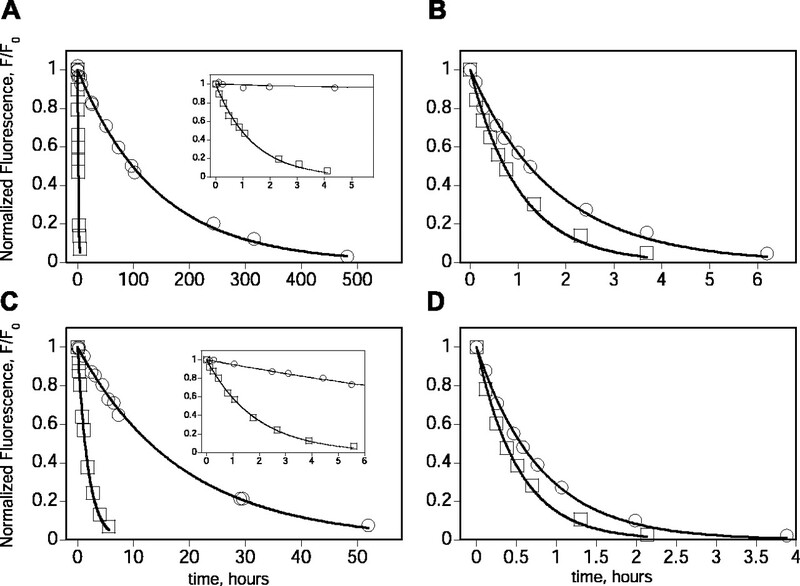 The correlation between DM susceptibility and intrinsic stability (Fig. 3⇑A) has interesting implications for the mechanism by which DM causes peptide release. It was surprising that, on the average, less stable peptides tended to be less susceptible to DM than stable ones. Since differences in intrinsic stability between complexes are controlled by peptide side chain/MHCII specificity pocket interactions, the correlation suggests that DM disrupts side chain/pocket interactions. However, the disruption is not complete; otherwise, dissociation rates in the presence of DM would not differ between peptides and would be much faster than those observed here. In addition, the fact that the correlation between kobs and kin is modest suggests that DM not only disrupts side chain/pocket interactions, but also distorts the Ag binding groove, probably including disruption of conserved hydrogen bonds. An additional factor to consider is the rate of bimolecular association of DM and peptide/MHCII complexes. The dissociation rate of the least stable complexes in the presence of DM (mur. fIi 89–99/DR*1501; Table I⇑) establishes a lower limit for the bimolecular DM/DR association rate as ≥2 × 104 M−1s−1. This is based on the assumption that the DM-catalyzed peptide release cannot be faster than the rate at which DM and DR/peptide complexes collide. Based on this estimate, we conclude that under the conditions used, DM/DR association may become rate limiting at dissociation half-times of 2.5 min or less. The length of the N-terminal overhang did not correlate significantly with DM susceptibility. Furthermore, although there were hints that interactions involving the P1 pocket might affect DM susceptibility, this pocket was not unique in that regard, with C-terminal interactions making contributions of similar or greater magnitude. These findings are surprising, because recent mutagenesis studies have mapped the DM interaction site on HLA-DR to a lateral face near the peptide N terminus (37), and there is evidence that the P1 pocket, near this N terminus, controls DM resistance (42). Interestingly, a conformational change involving DR β58–69, near the C terminus of bound peptides, has been detected upon peptide binding to the MHCII groove using a mAb specific for this region of the molecule (60). Interaction between DR and DM may, among other changes, perturb this region, which is modulated by C-terminal peptide-MHCII interactions. Overall, our results are most consistent with a model in which DM causes a global conformational change in the Ag binding groove. Recently, it was speculated that DM facilitates peptide dissociation by selectively destabilizing one or two hydrogen bonds near the peptide N terminus (35). Indeed, disruption by mutagenesis of conserved hydrogen bonds, such as that between β81 His of I-Ad and the peptide backbone, greatly enhances peptide release (18, 19, 20). Hydrogen bond disruption in this system leads to a greater dissociation enhancement for less kinetically stable complexes. 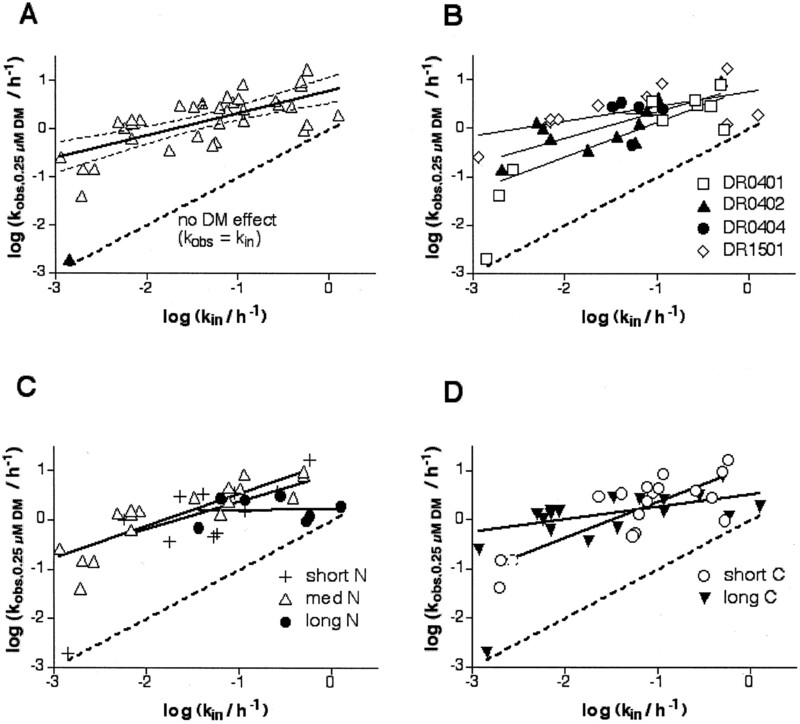 If DM promoted peptide release by a similar mechanism, we would predict a slope of >1 in plots of log kobs vs log kin. In contrast, we observed that the dissociation enhancement by DM tended to be greater for complexes with higher kinetic stability, with a best-fit slope of 0.47 in Fig. 3⇑A, although significant variation occurred. We conclude that while the mechanism of DM action may include disruption of conserved hydrogen bonds, this is unlikely to be its only mechanism. Single substitutions often had only slight effects on DM susceptibility. If DM susceptibility is controlled cumulatively by spatially distributed interactions, this might explain why such effects were missed by Weber et al. (40), who employed hybrid peptides combining sequences from a small number of parent peptides, each of which had a similar degree of DM susceptibility to begin with. DM has been reported to act as a peptide editor in APC, enhancing presentation of some peptide/class II complexes while extinguishing others (23, 24, 25). It has been proposed that DM performs a kinetic proofreading function by accelerating peptide dissociation. Thus, complexes that dissociate rapidly in the presence of DM (compared with the endosomal residence time of MHCII molecules) would be at a disadvantage relative to complexes that survive in the presence of DM. Our finding that DM differentially enhances the dissociation of different complexes is compatible with a kinetic proofreading model. However, we show that the effects of kinetic proofreading by DM cannot be predicted accurately from the intrinsic stability of peptide/MHCII complexes in the absence of DM. In the future, experimental strategies and computational algorithms to predict immunodominant epitopes from protein sequences might be improved by explicitly considering differences in DM susceptibility. However, achieving this will require extensive follow-up studies. Our observation that peptide association rates can also be differentially affected by DM adds another layer of complexity, whose impact on Ag presentation is difficult to assess. 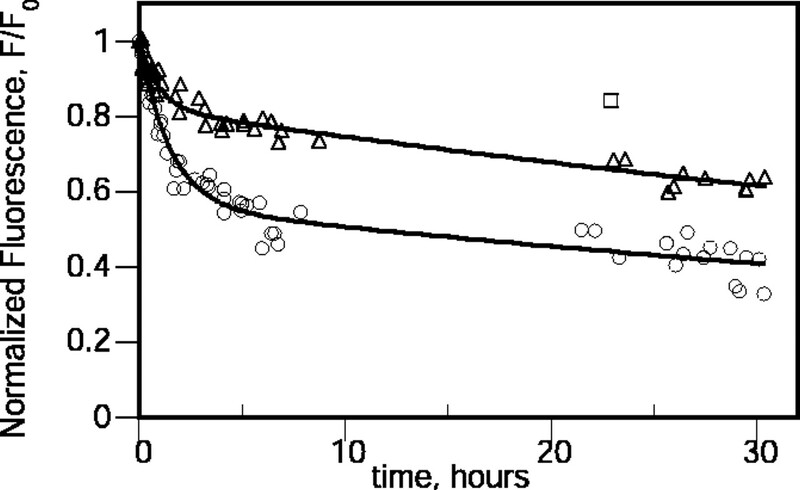 Critical unknown parameters include both the effective concentration and the time of exposure to DM in vivo. One intriguing possibility is that both highly DM-susceptible and highly DM-resistant complexes might be removed during DM editing; the resistant ones would be at a disadvantage during peptide association, whereas the susceptible ones would be removed during dissociation. The net outcome might be that most immunodominant peptides that have undergone DM editing in vivo would be selected to possess an average degree of DM susceptibility, as originally proposed by Weber et al. (40), based on studies of several immunodominant peptides and CLIP. Our study may have revealed a larger range of DM susceptibility by including non-natural peptide/MHCII combinations. We thank Bill Townsley, Justin Jones, and Jimothy Fahrni for technical help; Dr. Grete Sonderstrup for HCgp-39 peptides; and Thomas Anderson and Marija Vrljic for discussions. ↵1 This work was supported by National Institutes of Health Institutional Training Grant AI07290-15 (to M.P.B. ), Grant AI28809 (to E.D.M. ), Grant AI13587 (to H.M.M. ), National Research Scientist Award Postdoctoral Fellowship 1F32AI10298-01 (to M.P.B. ), the Arthritis Foundation (to E.D.M. ), and the Siegelman Fellowship, Stanford University (to R.B.). ↵3 Abbreviations used in this paper: MHCII, MHC class II; C II, human type II collagen; CLIP, class II-associated Ii peptide; f, fluorescein; f-peptide, fluorescein-labeled peptide; HCgp-39, human cartilage gp39; Ii, invariant chain; MBP, myelin basic protein.